Focused on relieving congestion and improving quality of life for Northern Virginians, the Authority is advancing 122 regionally significant, multimodal projects, totaling more than $1.975 billion in transportation investments for Northern Virginia’s transportation network. On July 1, the Authority’s Chairman and several Authority members joined the Town of Hillsboro to celebrate the Groundbreaking of the Route 9 Traffic Calming Project. 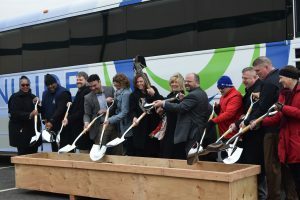 This project is the first of our newly adopted Six Year Program to break ground! The Northern Virginia Transportation Authority is a regional body that is focused on delivering real transportation solutions and value for Northern Virginia’s transportation dollars by bringing Northern Virginia jurisdictions and agencies together to prioritize projects and implement solutions. The Authority cancelled the May 9, 2019 business meeting as originally scheduled since there will be no new order of business to discuss. The Authority will reconvene on June 13, 2019. On May 13, 2019, NVTA will co-host a ribbon-cutting event with the City of Fairfax, celebrating Northfax intersection and drainage improvements – just in time for the kick-off of Infrastructure Week! Event details can be viewed, here. On March 13, 2019, NVTA, in partnership with ITSVA, hosted the 4th Annual Northern Virginia Transportation Roundtable. Both WAMU and WTOP covered event discussions. Read the WAMU story about cars communicating with traffic signals here and the WTOP story about self-driving shuttles coming to NoVA, here. In February 2019, NVTA co-hosted with the Northern Virginia Transportation Alliance a “Forum on the Economic Impacts of Transportation Investments,” which was held at the headquarters of the Northern Virginia Association of Realtors® (NVAR) in Fairfax. NVAR Magazine just published in both the print and online editions an article recapping the event. Read here. NVTA Executive Director, Monica Backmon, talks with the New York Times about Amazon coming to NoVA and impacts on transportation in the region. Read here (subscription required). On February 6, 2019, the Authority and the Northern Virginia Transportation Alliance co-hosted an event at the Northern Virginia Association of Realtors that brought experts in transportation, real estate, heavy construction and business together to discuss the economic benefits of the Authority’s $3 billion in regional funding of transportation projects and how transportation factors into business decisions. Also discussed was the recent Authority study on the economic benefits of the Authority’s multi-billion dollar funding of transportation projects aimed at tackling congestion across the region. An at-a-glance summary of the 2018 Economic Impact Study can be found here and a presentation on the economic impacts of the Authority-funded investments can be found here. You can also view the full event on the Authority’s Facebook page (@TheNVTA). NVTA Executive Director, Monica Backmon, rides along with WUSA 9 transportation reporter, Pete Muntean, to chat about the “Amazon Effect” and impacts on transportation in the region. Watch here. A new 2018 Economic Impact Study shows the economic impacts of Authority-funded transportation investments. The Study was conducted through a collaboration with NVTA staff and Richmond, VA-based Chmura Economics & Analytics, which utilized a nationally recognized economic modeling system that reduced the study’s cost while increasing transparency and reliability. Check out the full study here. 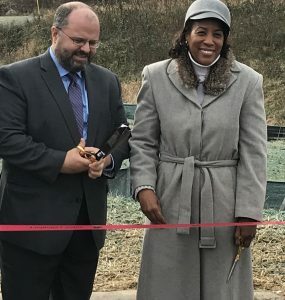 New and expanded mobility services are one step closer to reality in western Prince William County following a January 23rd groundbreaking for a nearly $50M OmniRide facility in Manassas. View the release here. During NVTA’s monthly business meeting held on Dec. 13th, Authority members unanimously voted to reappoint Hon. Martin E. Nohe as Authority Chairman for an unprecedented eleventh consecutive year. Additionally, Hon. Phyllis Randall was reappointed Vice Chair for the third year in a row. View the release here. Check out NVTA’s updated interactive Regional Transportation Projects Map, which has recently been updated to display all 95 projects funded with 70% regional funds in all four of the Authority’s funding programs to date. You can view it here. The Authority adopted its first six-year transportation program, the FY2018-2023 Program on June 14, 2018. The program funds 44 regionally significant, multimodal transportation projects totaling more than $1.285 billion. Each year, the Authority distributes 30% of its revenues to the member localities in which the taxes and fees are raised. So far, member localities have used their 30% revenues for projects like bus operation expenses, Capital Bikeshare and pedestrian improvements. Check out our interactive project information map for details on the transportation projects NVTA funds throughout the region! 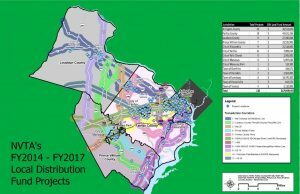 The map displays all projects funded with 70% regional funds in all four of the Authority’s funding programs to date [FY2014, FY2015-16, FY2017 and FY2018-2023 Six Year Program]. The Authority is responsible for developing and updating the long range regional transportation plan for Northern Virginia, currently TransAction. 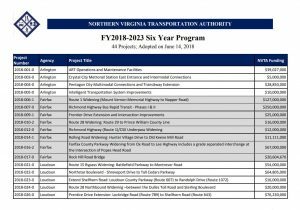 This long range transportation plan is used to evaluate and prioritize the funding of transportation projects in Northern Virginia.